Some people like taking their cats out for a walk. Others take their cats in the car for a drive. Yet someone in Malaysia decided to take their cat for a ride on a motor bike. Not surprisingly, the cat had to stand on the back of the motor bike seat and hold on with its claws in the back of the driver. Apparently this cat didn’t look scared among all the noise and traffic so it’s probably fine traveling this way although it’s probably not a recommended way to travel with your cat safely anywhere in the world. 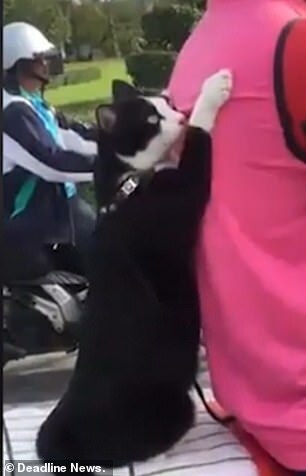 To see a video of a cat clinging toe the back of a driver’s back while riding a motor bike, click here.